When it comes to preserving and protecting your most cherished memories, you want to entrust them to the best. 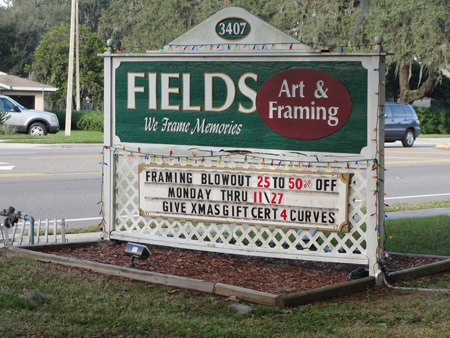 Fields Framing has been framing and protecting memories for 20 years. Owner, Eddie Matos, bought the business in January 2009 from Jerry Fields and has continued a proud tradition of serving the Greater Brandon community. Matos has 13 years of experience in picture framing and photo restoration. He got to know the customers by working with Jerry Fields for over a year before taking over the business. Matos has continued with the same level of care and integrity that the customers of Fields have known for 20 years.Fields Framing specializes in framing a simple photo to very detailed shadowboxes as well as full conservation framing techniques. “All of the work is done in house by the owner. Nothing is ever sent to an outside vendor. We use the utmost care with every item,” explained Matos. He recalls one job which involved a couple who brought in an old powder horn which was used to load rifles during the Spanish-American War. The powder horn was in a pouch and there was a photo of the customer’s relative wearing the pouch and holding the powder horn. The powder horn still had gunpowder in it. All of the items were incorporated into a shadowbox for display.“We have the largest selection of frames in the area ranging from the simplest design all the way up to oversized pieces with many layers,” Matos said. Additionally, Fields Framing utilizes conservation glass products which protect art and photos against fading and destructive forces within the environment.In addition to framing, Fields Framing offers photo restoration. Matos advises that all photos should be kept in an acid free storage environment, and you should always keep photos off of glass. Photo restoration starts at $65.00 and goes up depending on the level of damage and desired final outcome.Fields Framing is conveniently located at 3407 Lithia Pinecrest Rd. in Valrico. The phone number is 654-8616 and the email address is fieldsframing@me.com.